I haven't decided yet how to quilt it - by hand, or machine. I've only machine quilted a doll's quilt on my Brother and I don't know how it (he?) or I will stand up to it. Either way I'd like to do shadow quilting round the outside, and then take it from there. 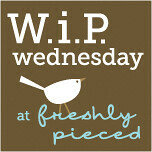 Meanwhile I'm linking up to WIP Wednesday at Freshly Pieced! Beautiful! I'm a Swoon addict... Love the fabrics you've chosen and the scrappiness. It's looking good, and sewing is definitely not skiving!! You and your machine will be fine with the shadow quilting so definitely have a go, you will rattle through it in no time.